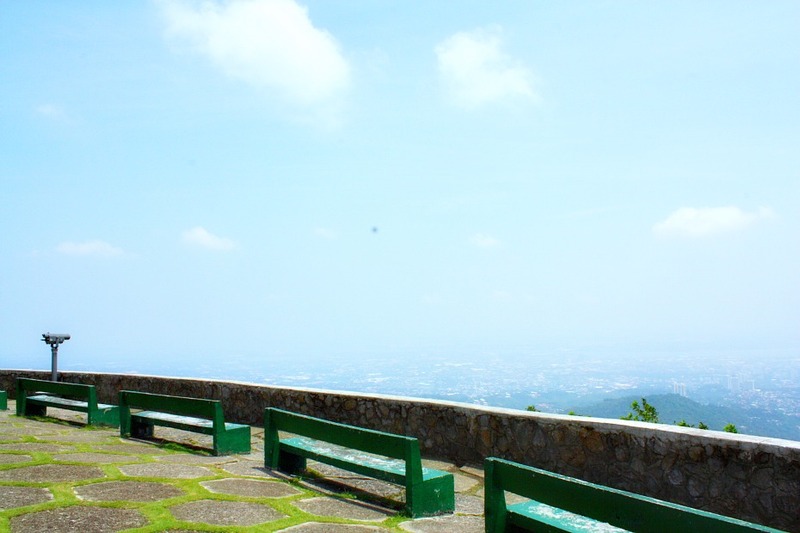 The Tops Lookout is better known as The Tops, a place on one of Cebu City’s mountain peaks. Up there, you will see the scenery of the green mountains and the sprawling city down below it and its skyline by day. By darkness, you can only view the night lights that enliven the city as far as your eyes can see. Although you can see and imagine the bustling metropolitan even at night, you could hardly hear a noise from the Tops’ where you stand on. Getting there will be your experience, as I have, a thrilling 20-minute ride up a winding concrete and asphalted road via motorbike. The accelerating motorbike’s sound you will hear as you ascend makes me getting more excited knowing I am getting closer every time we take swing either a right or left turn. The Tops Lookout is about 600 meters high above Cebu City giving one a great view of anything prominent, such as bell towers of churches, high rise buildings, universities, the Mactan Bridge, new hotels and other structures that define and describe the city’s past and present. The approximately one hectare property is about 2000 meters above sea level, which gives you a perfect vantage point of the city’s panorama. It would be more fun if you can identify some buildings or places in the city where you stand... try it! As your motorbike or car ushers you right to the entrance of the place, you know that you are entering into a dimension that can give you a special sight of the surrounding mountain range and the fast developing city in the country. There is a small station (or ticketing point) where you need to pay an entrance fee (P100 as of this writing 2015). This is the very area where you can park and have to walk up a little bit to get to the main gate of the walls. Outside those walls is where the drivers chat, relax or take a nap while waiting for passengers or their customer who asked to be waited and returned down below this mountain. Among others, one thing that caught my attention very strongly is the structure or architecture of the place. 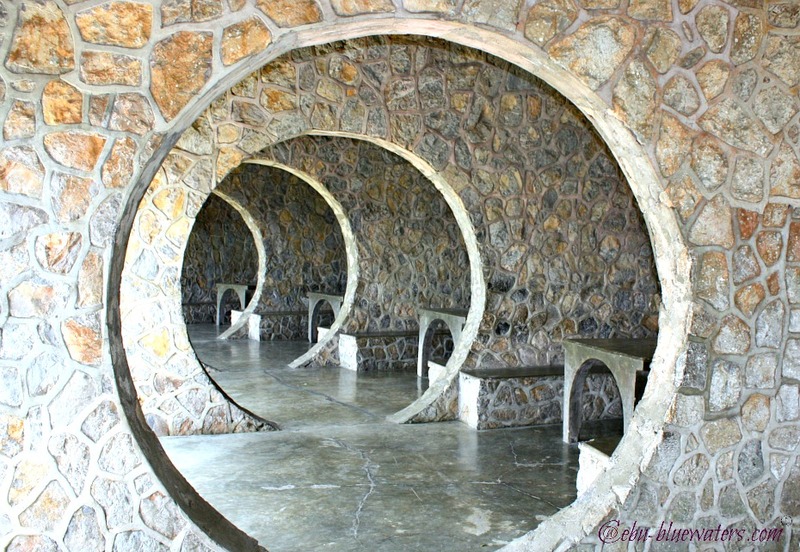 It has an uncommon circular design giving you an impression as if you are inside a circular or tube-like tunnel. 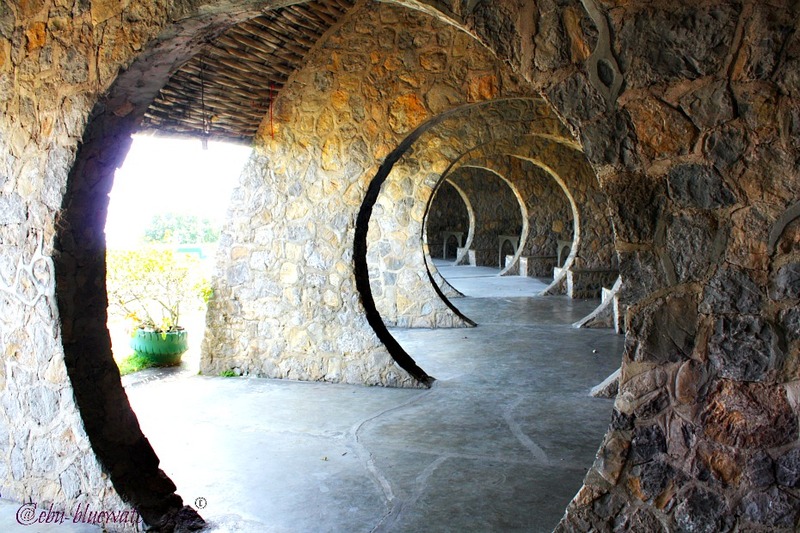 Looking at it from the outside, you will notice that the whole structure shaped like an incomplete circle. Inside this structure are rooms or spaces subdivided by circular entrances cutting across all these rooms or spaces. The ocular effect of the design is fantastic, as you can see in the photo here. 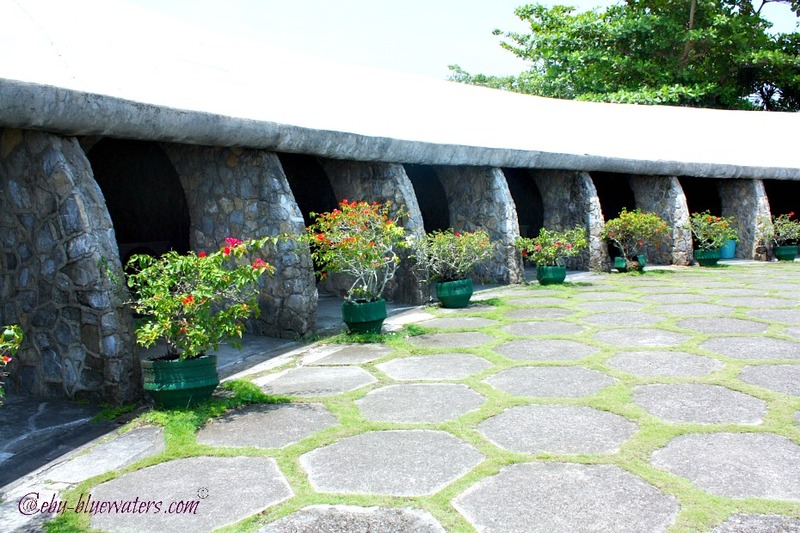 These rooms with circular entrances have their own individual solid and concrete tables and sits where you are allowed to settle down with your provisions. 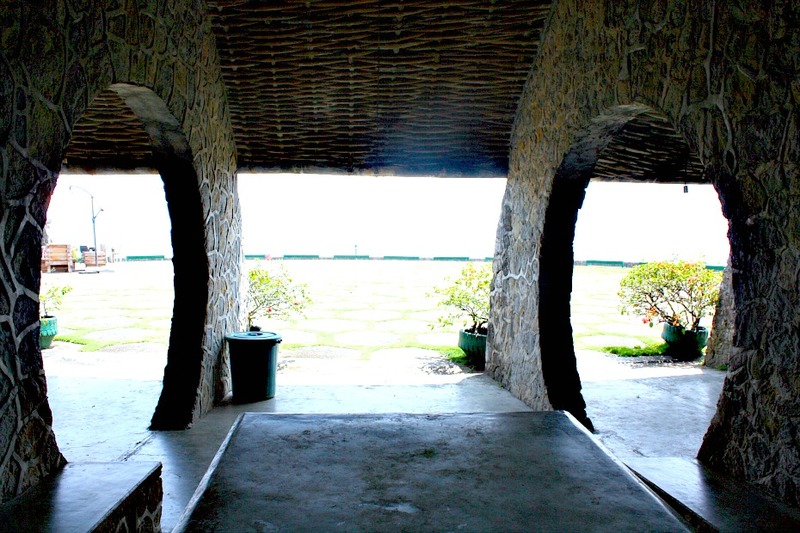 You will also notice the conspicuous concrete hexagon-shaped blocks on the lawn inside the area. 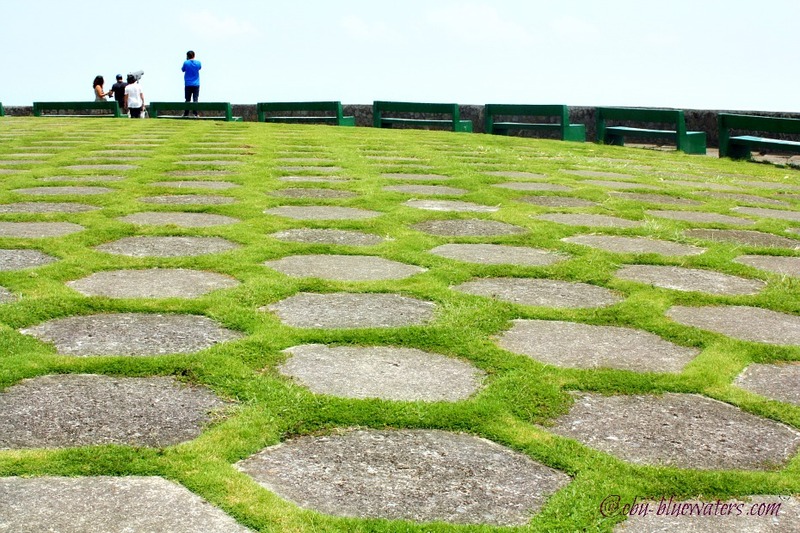 In-between the hexagon concrete blocks, you will see the green Bermuda grass living tightly together emphasizing their individual hexagon shape. Right on the front part of the area and just a couple of meters by the face of the mountain, you can enjoy the patient benches waiting for visitors to be served. You can sit on these benches as long as you want to either watch the sun sets or just enjoy the panorama of the city and the skyline during day time. You may also use the stable binocular available for public use hoisted right in-between two of the benches. There are snack shops or stores that sell some food and drinks. Noodles, chips, softdrinks, beers and some liquors are also available. There is also a souvenir shop that sells the usual products for travelers, such as hats, decors and accessories, among others that can be useful as gifts for your friends and loved ones. 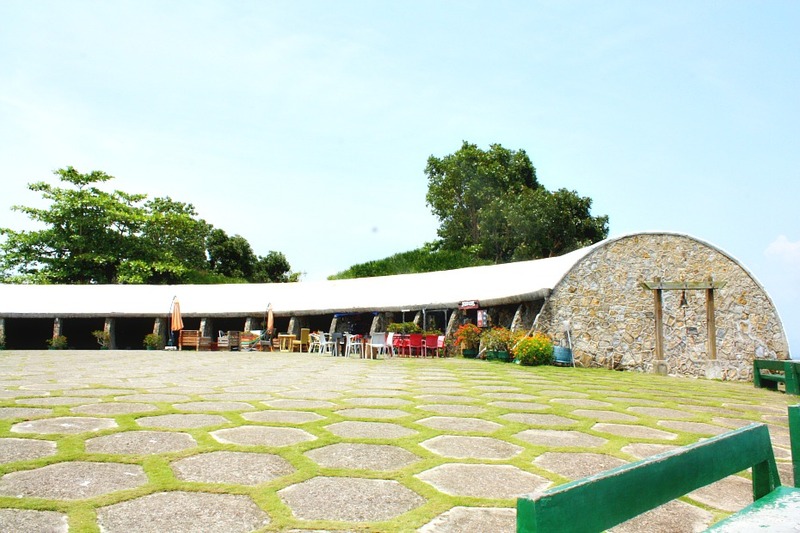 Right in the middle of the covered ground of The Tops Lookout, you can use the tropical style setting arrangement for relaxation – sits and furniture with huge parasols. Other sits and tables are available and provided for by their respective shops or store intended for their customers. Of course, although the area seems to look bare and treeless, you will notice the shy flowering plants arranged close to the circular structure mentioned above. Their presence softens the hard circular wall structure. I saw bougainvilleas. A Bougainvillea is a tropical ornamental plant that grows with colorful flowers for 11 months a year, especially when it is planted in the right area with the right climate. Authors say there are about 18 species of such thorny flowering bush (vine or tree) and I’m sure you will notice that some of them on The Tops’ vicinity. The following is your best guide and tip to get to the place. Certainly, there are various ways and means and depending on your mode of transport. You can take it from the nearby JY Square Mall which is located in Gorordo Avenue, Lahug (Salinas Drive). You can get to this mall (actually, a supermarket and grocery store) by taking a Jeepney which has a label ‘JY Mall’ from near SM Cebu. Upon arrival at JY Mall, you’ll easily find motorbikes and drivers waiting and even enticing passengers to pick them. Pick your choice and make sure you negotiate the usual fare (P100 one way). The drivers will wait if you ask them to and would not stay very long at The Tops Lookout. Of course, you can pay them for that same amount. You can also take a cab or taxi from around JY Square Mall to The Tops. This could be just a bit faster and safer than the habal-habal. But it will cost you more – about a thousand pesos and you shouldn’t pay more than that. Negotiate for a better rate before taking off. Yes, a jeepney ride is also available. However, since not many passengers go towards that direction regularly jeepney drivers offer only a limited number of trips in a day. This takes time although it is way a lot cheaper. Of course, you can go to the Tops anytime you want with your own ride. There is a parking area right infront of their entrance gate. Since there is no time limit for your stay, you can spend time as much as you can relaxing. For those who are renting vehicles or taking the habal-habal, you have to plan and think the worth of your penny. If you spend some amount (e.g. 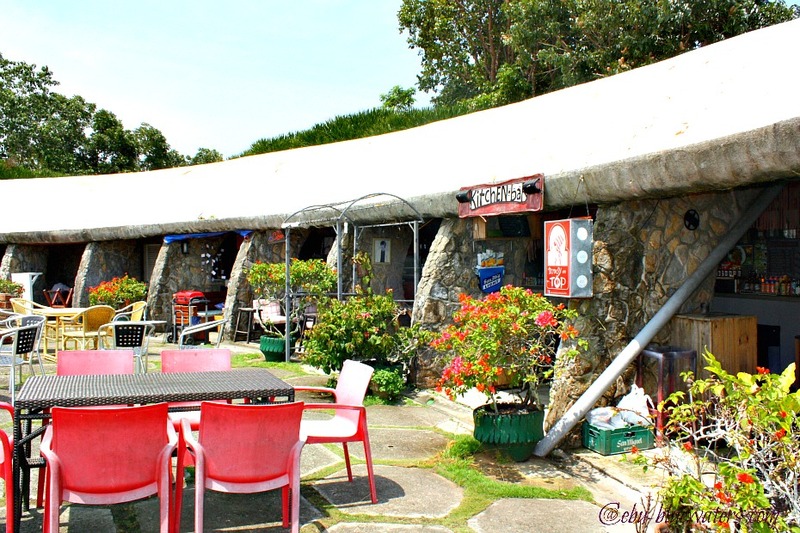 P300 for a motorbike and entrance fee), think that you should use it well by spending your time longer and enjoying the place and view better. Enjoy the view from there and not only the place itself. It is only a vantage point from where you can enjoy the sights of Cebu City’s panorama and skyline and the mountains and hills around. Thanks for reading to the end and please use this travel guide site for your future travels in Cebu Province. Hotels near The Tops Lookout. Check them out to see if you like one of them.